Sarah Elia is a lecturer at the Haggerty English Language Program at the State University of New York (SUNY) at New Paltz. She also teaches at the International College of Chongqing University of Education in Chongqing, China. Sarah is editor of Secondary Accents, the Newsletter of the Secondary Schools Interest Section of TESOL International Association. She has taught English to adult learners at Dutchess Community College and The Cabrini Sisters “Center for New Americans”, both in New York. She has written articles for publications including the blog of the American Historical Association, History News, a magazine of the American Association for State and Local History, and The New York Times Learning Network. International Educator magazine highlighted her in an article about educational technology. She has presented at the NYS TESOL Annual Conference, Applied Linguistics Winter Conference, SUNY Language PACT and TESOL International Convention. She has been active in NYS TESOL serving as President, Second Vice President, Assistant Chair and Scheduling Chair of the 43rd Annual Conference, and Chair of the 44th Annual Conference. She holds a B.A. in music from Bard College and an M.S. in TESOL from SUNY New Paltz. Denise Góñez-Santos is from Buffalo, New York. She earned her Bachelor's of Science degree at D'Youville College and her Master's Degree in Education at SUNY Buffalo. Denise began her career as a bilingual education teacher at Herman Badillo Bilingual Academy in Buffalo, New York. She has 34 years of experience in ESL and bilingual education. Denise was delighted to receive the honor of NYS TESOL Member of the Month, November 2016. The New York State Association for Bilingual Education recognized Denise with the Gladys Correa Memorial Award for outstanding contributions in the field of Bilingual Education on March 4, 2011. Currently, Denise is the Executive Director of the Regional Bilingual Education - Resource Network (RBE-RN) West located at Erie 1 BOCES in Western New York. The RBE-RN West is part of a statewide system of support funded by the New York State Education Department (NYSED) to enhance the knowledge and competencies of educators, parents and community members for promoting the academic excellence of English language learners (ELLs) in New York State schools. The RBE-RN West provides the highest quality technical assistance, professional development and resources to ensure success for our students. Denise is delighted to serve as Buffalo Region Chair together with the local leadership team of Melissa Duquette, Colleen Glahe, Caressa Guerrero, Todd Mitchell, Kim Wolf, and Elena Dokshansky. She is the recipient of numerous awards, but she states that her greatest achievement is being the mother of Jacob and Lucas Santos. Kerri Bohringer is an ENL teacher at Roy C. Ketcham High School in the Wappingers Central School District and an adjunct lecturer at the State University of New York at New Paltz. Kerri has also worked abroad teaching English in Costa Rica and Taiwan. In her years teaching, she has worked with the American Federation of Teachers’ Innovation Fund on the engagement of Secondary ELLs with the Common Core. She has also worked with the Research Foundation at the State University of New York at Albany on the Multimodal Observation Protocol that focuses on ELLs within the STEM classroom. Kerri has presented at NYS TESOL, TESOL International, NYSABE, and Share My Lesson Ideas and Innovations Virtual Conference. Her topics have included ELLs and the Common Core, current events in the ESL classroom, collaborations with neighboring universities, and co-teaching strategies. She holds a B.A. in Anthropology and a M.S. in TESOL from SUNY New Paltz. Pam has worked in the Poughkeepsie City School District for 9 years, as a K-8 ENL teacher and K-12 District ENL Coach. She has a Bachelor's degree in German, my Master's degree in TESOL, and she has post-graduate work in Humanistic/Multicultural Education. All degrees are from SUNY New Paltz. She has been a member of NYS TESOL and TESOL since 2007, and has had the opportunity to present at both conventions various times. She has lived abroad in three countries and understands what it's like to be immersed in a different language and culture. She believes strongly that every child has the right to be bilingual, and her efforts in school advocate to promote this belief for not only our ELLs, but our mainstream English-speaking students. To that end, although she works in an ENL stand-alone program (Poughkeepsie does not have a bilingual program), she believes in the benefits of the dual-language approach and hope that one day all students can achieve the seal of biliteracy on their high school diploma. Alexandria Wolochuk, O.P., received her Ph.D. in TESOL from New York University in New York City. She is an Associate Professor in the Graduate Education Program at Molloy College in Rockville center, New York and a member of a religious community, the Order of the Sisters of St. Dominic, Amityville, New York. Kelley Cordeiro serves both at the college level, as an Adjunct Professor in the Graduate Education TESOL program for Molloy College, in Rockville Centre, New York, as well as at the elementary level, as an instructor of English as a New Language in the Farmingdale Public School District. Prior to this, she taught for the Diocese of Rockville Centre. She earned her MS in Education from Molloy College, holding Professional Certification in the areas of Childhood, Early Childhood and TESOL, as well as advanced certification in Special Education, birth to second grade, and grades 1-6. She is a member of the Delta Kappa Gamma Society (DKG) International Honor Society for Women Educators, the recipient of the Molloy College Graduate Education Faculty Honors Award, as well as the Long Island ESOL 2010 award for Outstanding ESL Teacher Candidate. She is also the proud mother of three children. Jordan Van Horn is the Evening and Saturday Program Coordinator at the English Language Center at LaGuardia Community College. Prior to this role, she was the ESOL Programs Coordinator at the Center for Immigrant Education and Training and an ESL instructor for adult immigrant and academic populations. While teaching at the NYC Welcome Back Center, Jordan designed curricula for immigrant nurses enrolled in a Bridge to Healthcare Program. She has presented on a number of topics, including utilizing visual thinking strategies in designing classroom tasks and building civic knowledge and advocacy in the classroom. Her work with NYS TESOL began when she served as the Research Proposal Chair for the 2016 Applied Linguistics Winter Conference and has continued as the current NYC Region Co-Chair. In this role, she hosts the biannual “Night at the Museum” event, which invites museum educators from around the city to speak to teachers on ways to engage learners in museum spaces and how to use the context of exhibitions to build language. Jordan graduated with an MA in Applied Linguistics from Teachers College, Columbia University. 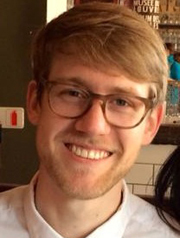 Tristan Thorne holds a BA in Language Studies from UC Santa Cruz and an MA in Applied Linguistics from Teachers College, Columbia University. He has taught English in Spain, Japan, and the United States. In addition to teaching at the American Language Program at Columbia University, Tristan is also a Curriculum Specialist for Tools for Clear Speech, an academic support program at CUNY's Baruch College that helps develop the oral communication skills of English language learners. His areas of interest include second language identity, technology in the classroom, and the assessment of second language speaking skills. Alison Doughtie is a professor of English as a second language at Mohawk Valley Community College in Utica, NY. She received a BA in Russian language from Rice University, an MA in Slavic languages and literatures from Indiana University, and an MA in TESOL/applied linguistics from Indiana University. She has over twenty years of experience teaching English in a variety of higher ed settings and to a wide range of students. Her interests include syntax, contrastive rhetoric (and the connection between the two), as well as ESL higher education and adult learner concerns.